The suicide of Ajax. Etrurian red-figured calyx-krater, ca. 400–350 BCE. Sophocles' Ajax, or Aias (/ˈeɪdʒæks/ or /ˈaɪ.əs/; Ancient Greek: Αἴας [a͜í.aːs], gen. Αἴαντος), is a Greek tragedy written in the 5th century BCE. Ajax may be the earliest of Sophocles' seven tragedies to have survived, though it is probable that he had been composing plays for a quarter of a century already when it was first staged. It appears to belong to the same period as his Antigone, which was probably performed in 442 or 441 BCE, when he was 55 years old. The play depicts the fate of the warrior Ajax, after the events of the Iliad but before the end of the Trojan War. The great warrior Achilles has been killed in battle. 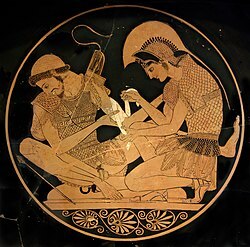 As the man who now can be considered the greatest Greek warrior, Ajax feels he should be given Achilles’ armor, but the two kings, Agamemnon and Menelaus, award it instead to Odysseus. Ajax becomes furious about this and decides to kill them. However, Athena steps in and deludes Ajax into instead killing the spoil of the Greek army, which includes cattle as well as the herdsman. Suddenly Ajax comes to his senses and realizes what he has done. Overwhelmed by shame, he decides to commit suicide. His concubine, Tecmessa, pleads for him not to leave her and their child, Eurysakes, unprotected. Ajax then gives his son his shield, and leaves the house saying that he is going out to purify himself and to bury the sword given to him by Hector. Teucer, Ajax’s brother, arrives. Teucer has learned from the prophet, Kalchas, that Ajax should not be allowed to leave his tent until the end of the day or he will die. Tecmessa and soldiers then try to find Ajax, but they are too late. Ajax has indeed buried his sword - by impaling himself upon it. Before his suicide, Ajax calls for vengeance against the sons of Atreus (Menelaus and Agamemnon) and the whole Greek army. Tecmessa is the first one to discover Ajax’s body. Teucer then arrives and orders that Ajax’s son be brought to him so that he will be safe from foes. Menelaus appears and orders the body not to be moved. The last part of the play is taken up with an angry dispute regarding what to do with Ajax’s body. The two kings, Agamemnon and Menelaus, want to leave the body unburied for scavengers to ravage, while Ajax’s half-brother Teucer wants to bury it. Odysseus arrives and persuades Agamemnon and Menelaus to allow Ajax a proper funeral. Odysseus points out that even one's enemies deserve respect in death. The play ends with Teucer making arrangements for the burial. The original title of the play in the ancient Greek is Αἴας. Ajax is the romanized version, and Aias is the English transliteration from the original Greek. Proper nouns in Ancient Greek have conventionally been romanized before entering the English language, but there is now a trend toward using direct English transliterations of the original Greek. Aiai! My name is a lament! two and three times in my agony. and then again, aiee, for what is happening. Ajax, as he appears in this play, in the Iliad, and other myths, is a heroic figure, a "rugged giant", with strength, courage and the ability to think quickly well beyond the normal standards of mankind. He was considered a legendary character to the people of ancient Athens. Numerous Homeric myths describe him coming to the rescue of his fellow man in dire moments. Hugh Lloyd-Jones points out that many authorities consider Ajax an early play, but he suggests that if the text includes material that in his edition he has bracketed, then it would seem to be a "mature masterpiece". Lloyd-Jones considers various lines that have been taken by critics interpreting the play, and finds that some consider that the Greek gods are being portrayed by Sophocles as just, and that when Ajax suffers it is a learning-experience for the character and the audience. Other interpretations of the play, according to Lloyd-Jones, instead consider that Ajax is being portrayed heroically in defiance of the unjust and capricious gods. Lloyd-Jones, notes that Ajax’s murderous intentions in this play are not softened by the playwright, and the difficult aspects of his character are fully depicted, but in spite of that Sophocles shows profound sympathy for the greatness of Ajax, and appreciation for the bravery in Ajax’s realization that suicide is the only choice — if he is to maintain his conception of honor and his sense of self. In another interpretation, Robert Bagg and James Scully point out that the play is composed in two distinct parts; the first part is steeped in the old world, a world of kings and heroes, and the second part resembles more the democratic world of Sophocles’ Greece, and is marked by an imperfect debate of contending ideas. Bagg and Scully consider that the play, with its two parts, may be seen as an important epoch-spanning work that raises complex questions, including: How does fifth century Greece advance from the old world into the new? Especially considering that Greece, in its stories and thoughts, clings and reveres the old world? And while clinging to the past, Greece considers that its new, democratic order is important and vital. As Bagg and Scully contend, Ajax, with his brute force has been a great warrior-hero of the old world, but the Trojan war itself has changed and become a quagmire; what’s needed now is a warrior who is intelligent — someone like Odyseus. Ultimately, according to Bagg and Scully’s interpretation, Ajax must still be respected, and the end of the play demonstrates respect and human decency with the promise of a proper burial. John Moore interprets the play as primarily a character study of Ajax, who, when he first appears covered in the blood of the animals that he in his madness has killed, presents an image of total degradation; the true action of the play, according to Moore, is how this image is transformed from degradation, as Ajax recovers his heroic power and humanity. The play, according to Moore, personifies in Ajax an affirmation of what is heroic in life. Translators Frederic Raphael and Kenneth McLeish called the work a "masterpiece", arguing that "Sophocles turned the almost comic myth of a bad loser into a tragedy of disappointment, folly, and divine partiality." In a study of the phenomenon of suicide bombers, one author, Arata Takeda, says that though in the end it doesn't quite work that way, Ajax’s death resembles that kind of strategy, when Ajax calls on the Erinyes, the “avenging deities of the underworld”, to destroy his foes. The American director Peter Sellars staged the play at La Jolla Playhouse in San Diego in 1986. The setting was relocated to the United States in the near future, having recently won a war in Latin America, which had, however, gone very badly. Howie Seago played Ajax, Ralph Marrero played Menelaus, Aleta Mitchell played Athene, and Ben Halley Jr. was the leader of the chorus. The set design was by George Tyspin and the costumes by Dunya Ramicova. Ajax was produced at the American Repertory Theater in Cambridge in 2011, in modern dress, with a setting that appeared to be a war zone somewhere in the Middle East. It was translated by Charles Connaghan, and directed by Sarah Benson. In May 2016, Jeff S. Dailey directed the play for a limited Off Broadway run at the John Cullum Theatre in midtown Manhattan. [non-primary source needed] It set the play Sophocles' original location of Troy and featured Matthew Hansen in the title role. Timberlake Wertenbaker's play Our Ajax, which was first performed in November 2013 at the Southwark Playhouse, London, was inspired by Sophocles' tragedy. It has a contemporary military setting, with references to modern warfare including the conflicts in Iraq and Afghanistan. Wertenbaker made use of interviews with current and former servicemen and women in developing the play. The Belvedere Torso, a marble sculpture carved in the first Century BCE depicting Ajax. Frederick Raphael and Kenneth McLeish, 1998. Herbert Golder and Richard Pevear, 1999. George Theodoridis, 2009 – prose: full text. ^ Finglass (2011a, 1-10), Harsh (1944, 91), and Moore (1969); Golder tentatively dates the play to 445—440 BCE (2010, 19); Woodruff states that "Women of Trachis and Ajax are generally considered fairly early" (2007, xiv); Watling argued that the "general shape and style place Ajax among the earlier works, and its position, in the oldest collections, at the head of the list, indicates a strong tradition of its having been the earliest of the extant plays" (1953, 7); Jebb argued that Ajax is later than Antigone (1896a, li-liv). ^ The translations by Michael Evans (1999) and James Scully (2011) use Aias, as do the translations by Golder and Pevear, by Lewis Campbell, and by Oliver Taplin. ^ Esposito (2010, 190-192) and Jenkins (2015, 90). ^ Herbert Golder's translation in Burian and Shapiro (2010). ^ Frederick Raphael and Kenneth McLeish's translation in Slavitt and Bovie (1998). ^ Bagg and Scully (2011) pg. 3. ^ Vickers, Michael (2014). Sophocles and Alcibiades: Athenian Politics in Ancient Greek Literature. Routledge. p. 4. ISBN 1317492927. ^ Moore (1957) pg. 3. ^ Raphael, Frederic; McLeish, Kenneth (1998). "Translators' Preface". Sophocles, 1: Ajax, Women of Trachis, Electra, Philoctetes. By Sophocles. University of Pennsylvania Press. p. 4. ISBN 0812216539. ^ James Scully's translation, in Bagg and Scully (2011, 52). ^ Takeda, Arata (2010). "Suicide bombers in Western literature: Demythologizing a mythic discourse" (PDF). Contemporary Justice Review. 13 (4): 463–464. doi:10.1080/10282580.2010.517985. ^ a b c d Sullivan (1986). ^ Francklin (1759, v.1, i-ii & 1-90). ^ Jebb's 1917 prose translation was previously published in 1896 adjunct to a Greek text of Sophocles' plays with commentary. The English translations of the plays were first published as a separate English-only volume in 1917. ^ Reprinted in Griffiths and Most (2013). ^ This text was used in Peter Sellars's 1986 production; see Sullivan (1986). ^ Slavitt and Bovie (1998, 1-70). ^ Burian and Shapiro (2010, 26-80). ^ Bagg and Scully (2011, 13-98). ^ Brill's Companion to the Reception of Sophocles. BRILL. 2017-04-03. ISBN 9789004300941. ^ "After Plateau, This Could Be Boston's Golden Age Of Theater". wbur. Retrieved 2018-02-11. Bagg, Robert and James Scully, eds. 2011. The Complete Plays of Sophocles: A New Translation. By Sophocles. New York: Harper. ISBN 978-0062020345. Buckley, Theodore Alois. 1849. The Tragedies of Sophocles, in English prose. London: Henry G. Bohn. Burian Peter, and Alan Shapiro, eds. 2010. The Complete Sophocles: Volume II: Electra and Other Plays. Vol 2. Electra and Other Plays. By Sophocles. Greek Tragedy in New Translations ser. Oxford: Oxford University Press. ISBN 978-0195373301. Campbell, Lewis. translator. 2015 Aias by Sophocles. Simon and Schuster. Easterling, Pat. 2008. Introduction. In Raeburn (2008, xii-xxxiv). Esposito, Stephen. 2010. "An Essay on Sophocle's Ajax." In Odysseus at Troy: Ajax, Hecuba and Trojan Women. Ed. Stephen Esposito. New York: Hackett. ISBN 978-1585103966. 189-210. Evans, Michael, ed. 1999. Four Dramas of Maturity: Aias, Antigone, Young Women of Trachis, Oidipous the King. By Sophocles. The Everyman Library ser. London: Dent. ISBN 978-0460877435. Finglass, P. J. 2011a. Introduction. In Finglass (2011b, 1-70). ---, trans. and ed. 2011b. Ajax. By Sophocles. Cambridge Classical Texts and Commentaries ser. Vol. 48. Cambridge: Cambridge University Press. ISBN 978-1107003071. Francklin, Thomas. 1759. The Tragedies of Sophocles, from the Greek. Vol. 1. London. Golder, Herbert & Pevear, Richard, translators. 1999. Sophocles. Aias (Ajax) Oxford Univ. Press. ISBN 9780195128192. Golder, Herbert. 2010. Introduction. In Burian and Shapiro (2010, 1-22). Grant, Michael. 1980. "Sophocles." Greek and Latin Authors 800 BC-AD 1000. New York: HW Wilson. ISBN 978-0824206406. 397–402. Griffiths, Mark and Glen W. Most, eds. 2013. Sophocles II: Ajax, The Women of Trachis, Electra, Philoctetes, The Trackers. By Sophocles. The Complete Greek Tragedies ser. 3rd rev. ed. Original edition ed. David Grene and Richmond Lattimore, 1969. Chicago: University of Chicago Press. ISBN 978-0226311555. Harsh, Philip Whaley. 1944. A Handbook of Classical Drama. Stanford, CA: Stanford University Press. ISBN 9780804703802. Jebb, Richard Claverhouse. 1896a. Introduction. In Jebb (1896b, ix-liv). ---, trans. and ed. 1896b. Sophocles: The Plays and Fragments. Part VII. The Ajax. By Sophocles. Cambridge: Cambdrige University Press. 1907 reprint available at the Internet Archive. Jenkins, Thomas E. 2015. Antiquity Now: The Classical World in the Contemporary American Imagination. Cambridge: Cambridge University Press. ISBN 978-0521196260. Knox, Bernard. 1979. "The Ajax of Sophocles." Word and Action: Essays on the Ancient Greek Theater. Baltimore: Johns Hopkins University Press. ISBN 978-0801834097. 125-160. Lloyd-Jones, Hugh. 1994a. Introduction. In Lloyd-Jones (1994b, 1-24). ---, ed. & trans. 1994b. Sophocles: Ajax, Electra, Oedipus Tyrannus. By Sophocles. Loeb Classical Library ser. vol. 20. Harvard University Press. ISBN 978-0674995574. Meineck, Peter and Paul Woodruff, trans. and ed. 2007. Four Tragedies: Ajax, Women of Trachis, Electra, Philoctetes. By Sophocles. Hackett Classics ser. Indianapolis, IN: Hackett. ISBN 978-0872207639. Moore, John. 1969. "Introduction to Ajax". In Griffiths and Most (2013). Plumptre, Edward H. 1878. The Tragedies of Sophocles, a new translation. London: Daldy, Isbister & Co.
Raeburn, David, trans. and ed. 2008. Electra and Other Plays. By Sophocles. Penguin Classics ser. London: Penguin. ISBN 978-0140449785. Scully, James. 2011. Introduction. In Bagg and Scully (2011, 3-12). Slavitt, David R. and Palmer Bovie, eds. 1998. Sophocles, 1: Ajax, Women of Trachis, Electra, Philoctetes. By Sophocles. Penn Greek Drama ser. Philadelphia: University of Pennsylvania Press. ISBN 978-0812216530. Tipton, John, trans. 2008. Ajax. By Sophocles. Chicago: Flood Editions. ISBN 978-0978746759. Trevelyan, R.C., trans. 1919. The Ajax of Sophocles. By Sophocles. London: George Allen & Unwin. Watling, E. F., trans. 1953. Electra and Other Plays. By Sophocles. Penguin Classics ser. London: Penguin. ISBN 0-140-44028-3. Woodruff, Paul. 2007. Introduction. In Meineck and Woodruff (2007, vii-xlii). Healy, Patrick (11 November 2009). "The Anguish of War for Today's Soldiers, Explored by Sophocles". The New York Times. Ajax public domain audiobook at LibriVox, Campbell translation.